← Happy National Coming Out Day! Three Prominent Civil Rights Activists to Visit Rochester! We’re greatly looking forward to a visit from three remarkable women next week: Judy Richardson, Betty Garman Robinson, and Dorothy M. Zellner. All three women were on the front lines of the Civil Rights Movement and members of the Student Nonviolent Coordinating Committee (SNCC). The women will be on campus next Thursday, October 18, for a lunch at the Douglass Leadership House with undergraduate students, and then for a public lecture in the University of Rochester Interfaith Chapel at 7:30pm. Their presentation will look at the history of the Civil Rights movement, race and gender relations in the United States, and campus activism. They will also speak about non-violent organizing and the status of civil rights and voting rights today. 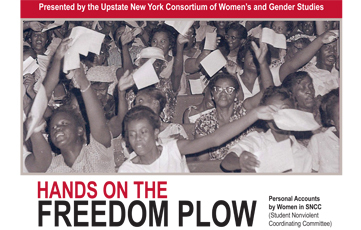 In 2010, Richardson, Robinson, and Zellner, along with several other SNCC women, edited and published Hands on the Freedom Plow: Personal Accounts by Women in SNCC. In Hands on the Freedom Plow, fifty-two women–northern and southern, young and old, urban and rural, black, white, and Latina–share their courageous personal stories of working for the Student Nonviolent Coordinating Committee (SNCC) on the front lines of the Civil Rights Movement. The testimonies gathered here present a sweeping personal history of SNCC: early sit-ins, voter registration campaigns, and Freedom Rides; the 1963 March on Washington, the Mississippi Freedom Summer, and the movements in Alabama and Maryland; and Black Power and antiwar activism. Since the women spent time in the Deep South, many also describe risking their lives through beatings and arrests and witnessing unspeakable violence. These intense stories depict women, many very young, dealing with extreme fear and finding the remarkable strength to survive. The women from SNCC are currently spread out all over the country but continue to do social justice work in different forms. In the current sociopolitical context of the United States – upcoming elections, labor disputes, debates over the future of affirmative action – these three women’s stories and insights are at once transformative, inspiring, and timely. This exciting event is made possible by a joint collaboration between the University of Rochester, SUNY Brockport, Monroe Community College, Hobart and William Smith Colleges, St. John Fisher College, and the Greater Rochester Chapter of the American Association of University Women (AAUW). The collaboration was facilitated by the Greater Rochester Consortium of Women and Gender Studies (GRC), which includes the Susan B. Anthony Institute. The three women will visit Hobart and William Smith Colleges on Friday, October 19, and end their Rochester area stay by giving a keynote speech at the Third Biennial Seneca Falls Dialogues on Sunday, October 21. Judy Richardson and other former SNCC staffers founded Drum and Spear Bookstore in Washington, D.C., which became the largest black bookstore in the country. Beginning in 1982, Richardson was director of information for the United Church of Christ Commission for Racial Justice. Richardson is an acclaimed film and documentary producer, researcher, and advisor and has helped develop and produce many award winning works, including the Academy Award-nominated Eyes on the Prize. As a senior producer for Northern Light Productions in Boston, Richardson produced historical documentaries for broadcast and museums. In 2000, Richardson received an Image Award for Vision and Excellence from Women in Film and Video. She lectures, writes, and conducts professional development workshops for teachers about the history and values of the Civil Rights Movement and their relevance to current issues. Richardson became a visiting professor at Brown University in the fall of 2012. Betty Garman Robinson began working in occupational health research after her time with SNCC, and eventually became the director of an HIV/AIDS study of women at Johns Hopkins School of Public Health. She returned to community organizing in 1997 as the lead organizer for Citizens Planning and Housing Association (CPHA). In 2003 she received an Open Society Institute (OSI) Community Fellowship to connect organizers across issues and constituencies. During the last decade she has worked closely with the Baltimore Algebra Project, the United Workers and Fusion Partnerships. She is the co-facilitator of the Ella Baker Grassroots Organizing Initiative and a member of the Charm City Labor Chorus. Email sbai@rochester.edu or call 585-275-8318 for more information! This entry was posted in Community, SBAI Events, UR Events and tagged #Activism, #civilrights, #dlh, #SNCC, #social justice, #womenofcolor. Bookmark the permalink.